After the Communications Tower is knocked off, Barcalow, looking out the viewport, somehow knows exactly where the damage to the ship has occured. This is a little like Captain Edward Smith looking out over the bow of the RMS Titanic and smelling which compartment was ripped open by the iceburg, but we must accept the givens of the scene. Barcalow turns to Ibanez and tells her to “Close compartment 21!” She turns to her left, reaches out, and presses a green maintained-contact button labeled ENABLE. This button is right next to a similar-but-black button also labeled ENABLE. As she presses the button, a nearby green LED flashes for a total of 4 frames, or 0.16 second. 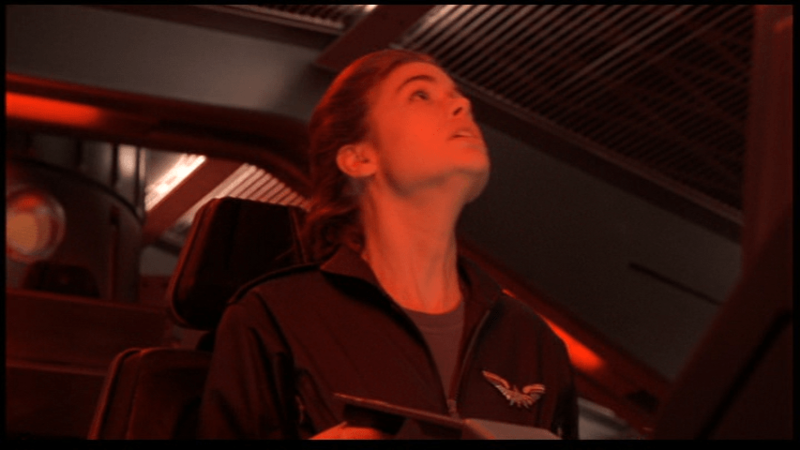 She looks up at some unseen interface, and, pleased with what she sees there, begins to relax, the crisis passed. Let’s presume he is looking at some useful but out-of-character-for-this-bridge display, and that it does help him identify that yes, out of all the compartments that might have been the one they heard damaged, it is the 21st that needs closing. Why does he have the information but she have the control? Time is wasted (and air—not to mention lives, people—is lost) in the time it takes him to instruct and her to react. How did she find the right button when it’s labeled exactly the same way as adjacent button? Did she have to memorize the positions of all of them? Or the color? (How many compartments and therefore colors would that mean she would need to memorize?) Wouldn’t a label reading, say, “21” have been more useful in this regard? What good does an LED do to flash so quickly? Certainly, she would want to know that the instruction was received, but it’s a very fast signal. It’s easy to miss. Shouldn’t it have stayed on to indicate not the moment of contact, but the state? Why was this a maintained-contact button? Those look very similar when pressed or depressed. A toggle switch would display its state immediately, and would permit flipping a lot of them quickly, in case a lot of compartments need sealing. Why is there some second place she must look to verify the results of her action, that is a completely separate place from Barcalow (remember he looks forward, she looks up). Sure, maybe redundancy. Sure, maybe he’s looking at data and she’s looking at video feeds, but wouldn’t it be better if they were looking at the same thing? I know it’s a very quick interaction. And props to the scriptwriters for thinking about leaking air in space. But this entire interaction needs rethinking. This entry was posted in Starship Troopers (1997) and tagged bad labeling, button, design challenge, emergency, fail, label, led, maintained-contact button, urgency, urgent. Bookmark the permalink. It’s the opposite of the infamous “Unlabeled Buttons” syndrome: Buttons and switches with labels that don’t convey enough information. There has to be a term for that.